Students may have to pay five times the current degree course cost at England's top universities if the cap is removed on tuition fees, research suggests. A study for education charity Sutton Trust looked at how fees for overseas students, which are unregulated, have risen at 20 universities. Some universities charge non-EU students more than £20,000 a year. The Russell Group of top universities said overseas fees often subsidised home degrees and so were higher. 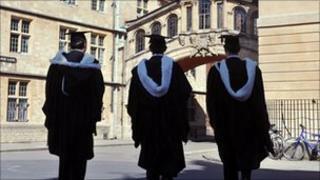 The charity also warned that poor students were the most likely to be deterred by higher fees. The Sutton Trust report said: "As the patterns for current overseas student fees demonstrate, charges for degree courses are likely to escalate rapidly if completely unregulated. "At the highest end of the market, this could mean annual fees perhaps five times the current annual undergraduate payments - assuming that current government subsidies continue." It added that universities with the "highest academic reputations" were likely to see the highest fee rises - particularly for courses with the highest financial returns. And students from poorer backgrounds were most likely to face problems in getting into universities of their choice, the report warned. Recent surveys have suggested that three-quarters of young people would be put off universities by fees of £10,000. The Sutton Trust called for a comprehensive set of grants, loans and support for poorer students. Another suggestion was that those from low income homes should get their first year at university for free. The report said: "The free first year it is hoped would alleviate some of the risk and uncertainty that deter non-privileged students from applying to certain courses and institutions." It also suggested introducing financial incentives for universities to recruit poorer students. This would involve creating a "bounty fund of tens of millions of pounds a year to reward universities that make special efforts to recruit such students". The UCU lecturers' union said the report backed its own findings that countries with deregulated fees charged more. UCU general secretary Sally Hunt said: "As we approach the delivery of the university funding review we are hearing more and more dark rumours about what Lord Browne might recommend. However, we are hearing no radical or progressive options. "If the funding review simply lists ways to squeeze more money out of students and their families then it will have spectacularly failed its remit. She said Lord Browne should look at taxing big business because of the substantial benefits it gained from a plentiful supply of graduates. President of the National Union of Students Aaron Porter said since fees had trebled over the past five years there had been no improvement in student satisfaction. He added that graduates were already leaving university with debts of £25,000 and entering a bleak employment market. Director general of the Russell Group of 20 leading universities, Dr Wendy Piatt, said universities were making a loss at the moment with a lot of their home students. "That's because we are under funded for several courses, particularly the most expensive science courses, and we are not allowed to ask them to contribute a little bit more to those costs." She added that it was not possible to extrapolate the pattern that international fees had followed for home fees. This was because international fees had been used to subsidise home fees.